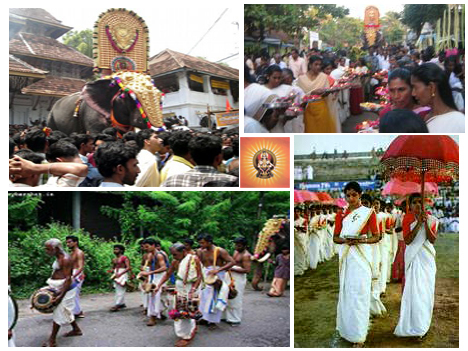 Ayyappa is known as "Hariharan Puthiran" because he is the son of Hari (Vishnu) and Haran (Shiva). His most common name is Manikanta because when the king of Pandalam found him, there was a mani (gem) tied around his neck. The asura princess Mahishi was burning up with anger at the trick the gods had pulled on her brother, the asura king Mahishasura. As Mahishasura was blessed with invulnerability to all men, the gods had sent goddess Durga, to fight and kill him. Thus, Mahishi began performing a fearsome set of austerities, and pleased the creator god Brahma. He granted her the boon of ruling the universe and being invulnerable except to a being that had not been born from a Woman's womb. Since such a person did not exist, she thought she was safe and began conquering and plundering the world. The gods implored Shiva and Vishnu to save them from this catastrophe. Vishnu found a possible solution to the problem. When Vishnu had taken on the Kurma Avatar, he also had to manifest himself as Mohini, the enchantress, to save the nectar of immortality (ambrosia or amrit) from the demons who were not willing to share it with the gods. If he became Mohini again, then the female Mohini and the male Shiva could have the divine child who would combine their powers and beat Mahishi. Some versions give a slightly more detailed version of the union of Shiva with Vishnu. One version tells that the asura Bhasmasura had so pleased Lord Shiva with his austerities that Shiva gave him a boon of anything he wished. So Bhasmasura asked for the ability to burn to ashes anything which he placed his hand over. No sooner had Shiva granted this, than Bhasmasura ran after the god, threatening to turn him to ashes. Shiva called to Lord Vishnu for help. He hid himself in a peepal tree as Bhasmasura ran here and there searching for the god. Vishnu became aware of the events, and decided that he would take the female form Mohini, "the Enchanting", and try to trump the asura's powers. When Bhasmasura saw Vishnu in this form, he was bewitched by her beauty. He earnestly tried to court her. So Vishnu instructed Bhasmasura to hold his hand over his head, and vow fidelity. With this act, Bhasmasura was reduced to ashes. Vishnu found Shiva and explained the whole affair to him. Shiva asked if he too could see Vishnu in this female form. When Vishnu appeared thus, Shiva was overcome with passion, and united with her. The two gods thus became "Harihara Murthi", that is a composite form of Shiva and Vishnu as one god. From this union, Lord Sree Dharma Sastha was born. 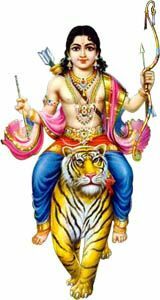 He combined in himself the powers of Vishnu and Shiva.Lord Ayyappan is a incarnation of Lord Sree Dharma Sastha and Lord Ayyappan is a visible embodiment of their essential identity. Lord Vishnu gifted the new-born deity with a little bejeweled bell necklace, so this god is called Manikanthan Swamy. He is also called as Shasthappan by most South Indian communities. Ayyappa lived in the Pandalam Palace as the son/savior of the King. He had super-human or divine knowledge, wisdom, and courage and loved the King and his people. He protected the King and the kingdom from the attacks of enemies. At the end of His life in Pandalam, He vanished into the forests and is ever since worshiped at the Sabarimala temple. As per Saint Agasthya's advice, King Rajasekara laid the foundation stone for the Sabarimala Shrine and completed the construction of the temple, with eighteen steps leading to it. To read the complete story with pictures click here. its really touching how you recorded Song for Lord Ayappa. Though i do not understand Malayalam I love to listen it. Somehow I feel I am connected to Lord Ayappa/Malayamam language/kerala.. Baba Nityananda. all these are nothing but our impressions of previous lifetimes.. now all i do is relive anything that comes up seeming unusual/surprising /unbelievable/strange/nostalgic/deja vu/connected/etc/etc :) i believe that's the best thing to do for karmic fulfillments.. namah shivaya..